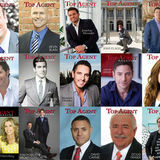 CONTENTS 4) KEEPING IN TOUCH – HOW TO STAY IN YOUR CLIENTS’ LIVES FOR THE LONG HAUL 10) 5 STEPS TO ACHIEVE LONG TERM SUCCESS AS A REAL ESTATE AGENT 12) GET YOUR HEAD IN THE GAME! MIKE PATEL After several years as sales manager for a bank, Mike Patel decided in 2004 that he really should be working in an industry that would allow him to better serve people. “I wasn’t satisfied not being able to help my bank clientele as I wanted to,” he says. “I didn’t feel like I was doing anything meaningful.” At the end of 2004, therefore, Mike transitioned to real estate, where he has grown and thrived ever since. As a Broker/Owner of Equity Pennsylvania Real Estate, Mike serves buyers and sellers in the Pennsylvania’s Bucks and Montgomery counties as well as nearby New Jersey communities in the Cherry Hill, Burlington and Mercer County areas. Personally licensed in both states, Mike’s brokerage includes 10 agents and support staff. “Most of my business is based on referrals,” he says. “That’s primarily because when I sell a home or I to a client, I’m selling them the property as if I’m buying it for myself. I always put my clients’ interests first.” By doing so, Mike gives his clients receive the transparency and time commitment they deserve, with him as their loyal advocate. “The money or the commission will come. My primary concern is to make sure that after I sell them their house, they’re going to be a happy client for life.” Mike draws great pride and pleasure from helping people with their home purchase or sale. “I just love selling a dream to someone,” he says. “The home buying process is one of the biggest decisions a person makes in their life and I love helping them get to that state. The best part of what I do is the happy people, who become lifelong clients and friends.” He maintains these relationships by staying in touch using a variety of useful communication tools. “A week after the sale or purchase, I call them to see if I can help them in any way.” After that, he includes them in regular touches, including newsletter emails, magazine subscriptions, phone calls, informative market updates and occasional postcard distributions. 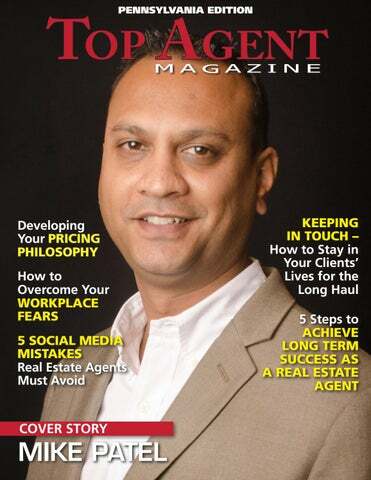 To learn more about Mike Patel, visit PatelSellsRealEstate.com or Equitybucksmont.com, www. How To Overcome Your Workplace Fears Fear is something that can help protect us from danger, but it is also something that can be a hindrance to us in our lives, especially when it keeps us from potentially thriving and growing as a person. This is especially true in the workplace. Here’ a look at some proven ways to overcome common workplace fears. Really owning the emotions that are putting you in a place of fear, is the first step. By just naming it and then talking it out in your head, what exactly you’re feeling and why, it can help deflate the fear. Think of it as releasing some of the fear into the ether. Yes, you’ll still be nervous about your presentation, but a lot of what was holding you back is gone. You’ll feel lighter, and hopefully have just enough butterflies to make your soar. Nothing can make you feel more isolated than going down the path of “This is something that only happens to me.” Trust me, it doesn’t, and you might be surprised to find out that some people have had it even worse. Talking to someone you trust and admire, hearing their own fear horror stories and how they overcame them, will help normalize what you’re feeling. Releasing yourself from the idea that it’s something about you, will be an enormous relief. after all. Of course it could also lead you to a really uncomfortable thought, you could lose your job. As bad as that is, it also gives you an opportunity to start focusing on what really matters, and how you might grow from the experience and possibly end up better off. Countless people in their dream jobs now, were once fired and thought it was the end of the world. Hopefully, that won’t happen to you, but learning to have confidence in your abilities to always find a way, will be a great tool in overcoming fears. If you’re a super-organized type, you might try actually setting aside time in your day to focus on your fears. It might seem odd, but it will let you NOT focus on your fears during the other hours of your day. Think of it as a task, you aren’t just sitting there worrying, you’re taking in your fears and figuring out ways to overcome them.